Jay Isch, Paula Rodriguez and Melodie Sparks of Deaf Focus. Photos by Andrea Matherne. We’ve all seen the viral videos: Babies with hearing loss receive cochlear implants and react to hearing their parents’ voices for the first time. Whenever one of those videos goes viral, activists in the deaf community like model Nyle DiMarco—who spoke in Baton Rouge last year—and Deaf Focus interpreting coordinator Jay Isch make it a point to share similar videos of deaf babies learning sign language. Videos of those implants offer a moving example of how technology can help, but it isn’t the only option. This often means opting for ASL over limited methods of communication that involve a deaf child learning to speak a few words or point to terms on a chart of common words, known as a communication board. Promoting ASL as an important means of communication is one aspect of Deaf Focus’ mission of advocating for the deaf community. Deaf Focus director and licensed clinical social worker Paula Rodriguez started the local organization in 2009 to provide deaf, hard of hearing and deaf-blind people equal access to resources, community services and events. It obtained its nonprofit status in 2016. 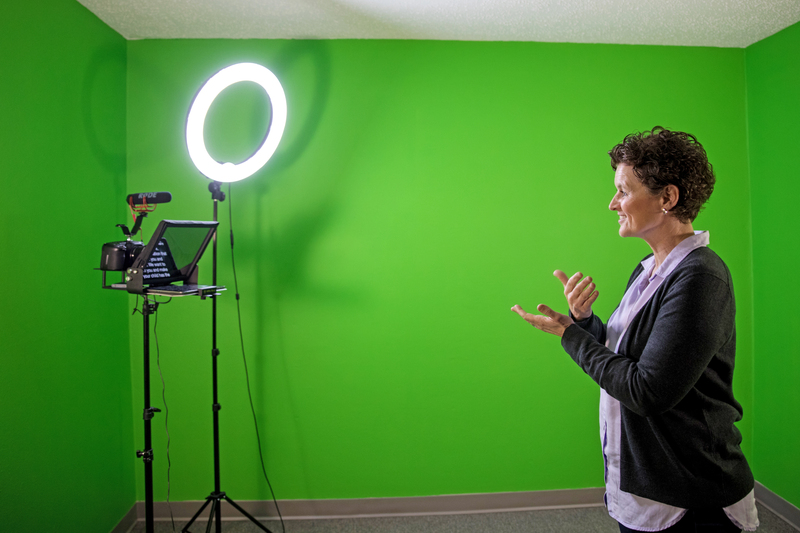 Director Paula Rodriguez uses the organization’s green screen and video equipment to shoot ASL videos for Deaf Focus’ website and social media. With a small staff and limited funds, the team has managed to make an outsized impact on the community. They offer resources like job training, career support, sign language interpreting and classes. They also provide counseling to deaf individuals, families and professionals. At the heart of the organization is its advocacy work. Isch and the rest of the team spend hours at the State Capitol testifying for bills that would improve the quality of life for the deaf community across the state—and arguing against those that would worsen it. Since 2015, the group has successfully lobbied for seven bills and against four bills, Isch says. The group was instrumental in the passage of a 2017 bill that saw the Louisiana Legislature change its official terminology from “deaf” and “hearing-impaired” to “deaf” and “hard of hearing,” a change Isch says was a step forward in getting the deaf community equal access to communication and employment. Isch is deaf and grew up in Boston, where he attended a deaf school and deaf summer camp. When he moved to Louisiana with his partner, he was shocked at the lack of resources available to deaf people, with only one deaf school in the state and few interpreters. Deaf Focus hopes to change this through its Deaf Education Summit, an annual conference where deaf students, parents, teachers, interpreters and others come together to learn about deaf education and language learning. This year’s conference is Feb. 1-2 at the Holiday Inn South. Deaf actor and comic CJ Jones and deaf actor Josh Castille from Lafayette will attend and lead activities with the students. Deaf Focus also leads Kidz Kamp, a three-day summer camp for both deaf and hearing children. Those days are jam-packed with activities like canoeing, ziplining, rock wall climbing and archery. But most importantly, the camp is inclusive and celebrates deaf culture, Rodriguez says. Deaf Focus aims to continue celebrating deaf culture and increase hearing people’s awareness of deaf people as valuable members of society—people who exist outside the occasional emotional video on social media.